A news article in IBN Live says, National Consumer Commission imposed a fine of Rs.1 crore on Kaun Banega Crorepati (KBC). Airtel (Sponsor of KBC) earned Rs.13.92 crore by the SMS sent by the viewers for the questions asked in KBC. In that, the prize amount was only Rs.1 crore. National Consumer Commission feels that, it is unfair practice, and fined Rs.1 crore. I am not sure whether it is fair or not. What the Commission and the petitioners expect Airtel and Starplus to do in this case? Reducing the SMS price or increasing the prize money? If they receive less no.of SMS, then they will make losses, and no company wants to make losses. Even with the existing setup, they have so many expenditures like paying almost Rs.1 crore to Shahrukh Khan per episode, and many other expenditures similar to that. Do they understand those? If we agree that, KBC is following unfair practices, then what about thousands of other contests in hundred other channels? Almost in all the channels, there are atleast ten programs where they have similar contests. There are many other programs, where one can vote by sending SMS and they will not get anything in return. What about those programs? Does someone have to give complaint for this? When Benazir Bhutto came to India in 2001, she met L.K.Advani at his home. L.K.Advani asked his daughter Pratibha to tell a joke on Benazir Bhutto to her. After hearing the joke, Benazir could hardly control her laughter, and she took a copy of the joke. This is the joke that Pratibha narrated to Benazir. Nawaz Sharif comes to Delhi for a meeting with Vajpayee. After dinner, Vajpayee says to Sharif: "Well, Nawaz Sahab, I don't know what you think of the members of your Cabinet, but mine are all bright and brilliant." "How do you know?" asks Sharif. "Oh well, it's simple', says Vajpayee. "They all have to take special tests before they can be a minister. Wait a second.... He calls Advani over and says to him, "Tell me, Advaniji, who is the child of your father and of your mother, who is not your brother and is not your sister?" "Ah, that's simple", says Advani, "It is me!". "Well done, Advaniji", says Vajpayee. Sharif is very impressed. He returns to Islamabad and wonders about the intelligence of the members of his Cabinet. He calls in his Cabinet Secretary, recounts the dinner table conversation that he had with the Indian Prime Minister, and asks him to test the IQ of a particular minister. The minister thinks and thinks and doesn't know the answer. "I'll have to think about it further. Please tell Prime Minister sahab that I'll let him know tomorrow?" "Of Course", says the Cabinet Secretary, "You've got twenty-four hours." The minister goes away, thinks as hard as he can, calls in his chief secretaries and joint secretaries, but no one knows the answer. Twenty hours later, the minister is very worried because he still had no answer and only four hours were left. Eventually, the minister says to himself: "I'll ask Beanzir. She's clever, she'll know the answer." He calls Beanzir. "Mohtarma", he says, "tell me who is the child of your father and of your mother, who is not your brother and is not your sister?" "Very simple", says Benazir, "It's me!" "Of course", exclaims the minister and rings up the Cabinet Secretary. "I've got the answer: it's Benazir Bhutto." "No, minister sahab", says the Cabinet Secretary, "you'll lose your job if you give this wrong answer. 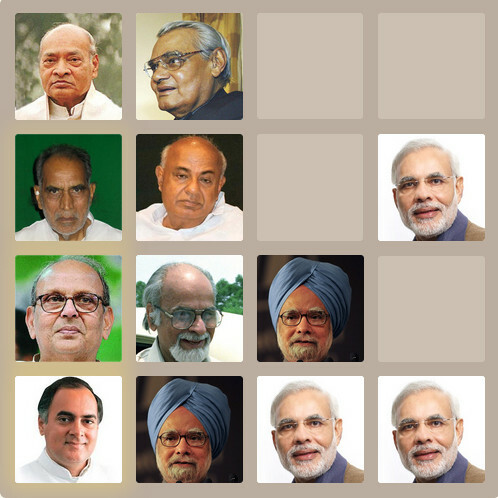 The right answer is: Advani!" When BJP formed the government, it took many initiatives to establish peace between India and Pakistan. In February 1999, Vajpayee undertook his historic bus journey to Lahore. Eventhough Pakistan started war against us in the same year, still Vajpayee invited Musharraf for Agra summit meeting in July 2001. It was not very successful, but, Vajpayee's continued efforts gave happy result in Jan 2004. During SAARC summit in Islamabad in Jan 2004, Vajpayee-Musharraf issued a historic Joint Statement. Through this, Pakistan committed itself, for the first time ever, not to allow any part of its territory, or territory under its control, to be used for terrorist acts aimed against India. Since then, India had good relationship with Pakistan. I know about Jayaprakash Narayana. I know about Loksatta. You don't need to tell anything. I know Jayaprakash Narayana since he was IAS officer. I work for Gemini TV. I interviewed Jayaprakash Narayana. When Jayaprakash Narayana was Managing Director, I was a General Manager. We went to a house, and asked the watchman to call some one in the house. He went and called, and one person came down. After seeing him, I felt like seeing him somewhere. I wondered whether he was a cine actor or not. But, could not get clarity. His name is K.Sankar Rao. He started asking questions like what is the position of the party, whether it is going to make alliance with Chiranjeevi party etc. When we were discussing, I heard three words, "BJP, his brother, and Satyanaranapuram". I got it by that. Kota Srinivasa Rao got BJP ticket for Satyanarayanapuram assembly loksabha constituency. K.Sankar Rao is famous actor in TV serials. I stopped watching TV serials a long time back. So, I could not recognize him immediately. After that campaign, I went to Loksatta Party Office, and attended the Press Meet of Dr.Jayaprakash Narayana. One common problem that I observed about the media is, the journalists do not have that much understanding about politics, and administration. They are expecting the answer for any question in very simple words known to everyone. The problem is there for all the journalists of all the news papers, and TV Channels. They force the politicians to give their stand on some thing which is not a problem. Even if Dr.JP clearly says that, it is a not problem because of X, Y, Z, still they ask him to tell in simple words like Support or Oppose. But, they are not aware of "Does not matter". They don't understand it, and because of that, they cannot write it in the news clearly. That is a big disadvantage of Loksatta. In Free Market Economics, Government allows anybody to do business without any restrictions. In Socialist Economics, Government does not allow everyone to do business. It puts restrictions on who does the business and in what terms etc. In Free Market Economics, the people decide the fate of the business. Depending upon the demand and supply, the price increases or decreases. If there is more demand, then new people/companies may start the business, and increase the supply. In Socialist Economics, if there is discrepancy in the demand/supply, Government has to take appropriate actions for that. I feel, Indian Government should not do business. It should follow Free-Market economics model. If it follows socialistic model, it has to do the following. Whenever there is a change in the demand and supply, Government should take adequate steps to balance. Till it balances those, Either people or Government will suffer. Whenever there is a change in the operation of the business, Someone in the government has to approve it. For example, if the business needs more money, Government has to approve it, and it takes significant time. The Prime Minister or Chief Minister must be good. Either PM/CM should take the direct responsibility of the organization, or entrust the responsibility to a sincere, honest, and talented leader. The leader should make sure that, there is no corruption at any level in the organization. The leader should make sure that, all the employees are working in the best interest of the organization. The leader should be aware of the opportunities to improve in the organization. The leader should do everything to make sure that people do not suffer because of the inefficiencies in the organization. If a new technology, or process makes this entire organization obsolete, still they should adopt the new technology and process, even it means closing the organization. Our Indian government (Present or past, and I don't expect even in future) can never do this kind of thing, because, it feels sympathy towards the employees of the organization. That's why, it did not allow VOIP for a long time, eventhough, many small and poor countries are getting huge benefit by that. There are many more things like this. If the government does not do even one thing, then people will suffer by that. Only in ideal world, government can do this kind of things without making people to suffer. Where as in free-market economics, these problems will not arise. All the companies compete with each other, and tries to provide best service at the least price. They know that, any corruption in their company will lead to the collapse of the company. They will not hesitate to adopt new technology to provide services for very less price. P.V.Narasimha Rao, Vajpayee, Manmohan Singh, and Nara Chandrababu Naidu follow(ed) Free-Market Economics. Rajeev Gandhi was in between these two models, and rest all Prime Ministers followed Socialist Economics. Present Congress (Except Manmohan Singh), and Communist Parties follow Socialist Economics. BJP, and TDP follows Free-Market Economics.